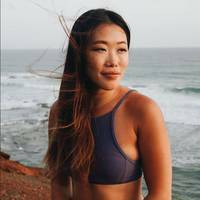 Born in Australia but bred in Singapore Erica was a competitive athlete throughout her life until a torn ACL ended her sporting career. After a long spell of feeling lost and incapable, little did she know the injury would direct her towards yoga where she not only rediscovered the possibilities of her body but also her true passion and calling in life. Through a dedicated and committed practice, Erica has come a long way from being the stiff girl who couldn't touch her toes or squat and absolutely hated back bending to now known for her strength and flexibility. As a practitioner and a full time yoga teacher, she is dedicated to sharing her knowledge and experiences both in class and on social media (@ericatenggarayoga). "Effort before effortless" is how she lives, practices and teaches. Combining both classical and modern teachings Erica's classes have a deep focus on finding the balance between working hard and surrendering to our struggles. Through simple progressive sequencing, alignment and a bit of humour Erica strives to simplify the complicated & make what seems impossible accessible.